Price and Where to Buy BareTraps Boots: At time of publication, the boots ranged from $32.70-$69.99 depending on size and color, on Amazon. They are also available on Footwear Unlimited’s website for a sale price of $29.99. Not waterproof—treat these with a protective spray before wearing in the rain or snow. Usefulness: 9/10. Boots are great for traveling in colder weather, except that they add so much weight to your bags. The BareTraps are lightweight but still sturdy. Value: 8/10. If you’re not picky about color, the price on Amazon is a great deal. Durability: 8/10. You’ll want to protect the exterior with a weatherproofing spray, but these are well-made boots and will last for a while if you treat them right. Cool Factor: 10/10. Riding boots are a hot trend, and we love the dark brown, cognac, and black colors offered in this style. Final Verdict: The BareTraps are sturdy and stylish—and they’re lightweight and comfortable enough that you can wear them when you’ll be on your feet all day. The heel height is also right on target, providing a little bit of lift without sacrificing comfort or stability. 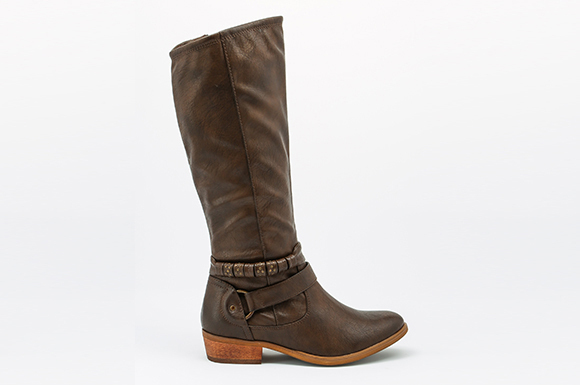 If you’re looking for a new pair of boots that will go equally well with boots as with dresses, these are the one.